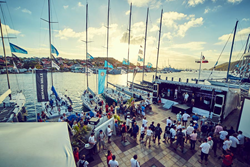 WIMCO Villas announced its return as a sponsor of Les Voiles de Saint Barth Regatta, which will run April 16th through April 22nd on the Caribbean island. As the exclusive villa rental partner of the race, the hospitality company will provide accommodations and its signature personal concierge service to sailors, sponsors and suppliers, as well as media members and sailing fans. While the island has rebounded from the impact of Hurricane Irma last fall, 90% of its hotel rooms are still under repair and will not be available until later in the year. A villa rental—which comes with a private pool, daily housekeeping and WIMCO’s personal-assistant like concierge service—is an attractive alternative for sailing crews and spectators. WIMCO’s collection of 370 villas in St. Barths spans from well-priced 1 or 2 bedroom private villas, to sprawling 8 bedroom estates. Sixty yachts will participate in this year’s regatta, which falls the day after low-season prices start for villa rentals. Regatta coordinator Alexandra Lemarchand-Guibout reports that there will be eight race categories spanning Maxi’s (including last years winner ’88 long Rambler) to multi hull speeders like 66’ long Paedo. Organizers will once again erect a race village on the quay in Gustavia harbor with live concerts staged after each day’s races. WIMCO and Buffett share a deep commitment to St Barths. In the days and weeks that followed the passage of hurricane Irma, both threw themselves into the recovery effort, championing the #stbarthstrong and #helpstbarth disaster relief funds, purchasing essential supplies in the US and delivering them to St Barths. Now six months later they come together again to support Les Voiles, and to celebrate the recovery of this very special piece of France in the Caribbean. “We have a 30 year history with the island and its people, and one storm doesn’t change that, instead it strengthens our commitment to St Barths” says WIMCO president Stiles Bennet. Recently featured on Bloomberg Travel, Forbes Life, Conde Nast Traveler, HarpersBazaar.com, the Today Show, and winner of Travvy and Magellan awards; WIMCO offers a selective and personally inspected collection of private villas in the Caribbean and Europe. Well-traveled Villa Specialists match clients with the right villa for their lifestyle and budget, and then arrange every aspect of their trip, supported by online itineraries for ease of access.